Naples (Italy) – June 5, 2018 (travelindex.com) – SUNx (Strong Universal Network), CNR-IRISS (Italian National Research Council – Institute for Research on Innovation and Services for Development) and t-FORUM (The Tourism Intelligence Forum) have joined forces to support Climate Resilient Sustainability for Travel & Tourism. With a shared vision of the eXistential nature of Climate Change and the vital importance of “glocal” research-based decisions and action, the partners will leverage their respective strengths to advance Impact-Travel ~ measured: green: 2050 focused. Prof Geoffrey Lipman, SUNx Co-founder, said “At SUNx we are convinced the Paris Accord and the Sustainable Development Goals are humanity’s lifeline – this was the vision of our mentor Maurice Strong. We want the incredibly influential Travel & Tourism sector to respond fast, objectively and with the best knowledge. We think that together, using modern research and communication tools, we can add a new dimension to travel resilience decisions starting now. The Paris clock is ticking”. Prof Jafar Jafari, President of the t-FORUM concluded “Our shared vision, research, and innovation databases are aligned to transfer intelligence to and within tourism”. Our collaboration promotes the concept and practice of tourism for development. 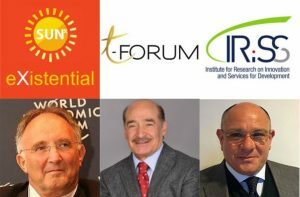 By linking academic and business perspectives, “we will reach out to like-minded colleagues around the world and will cultivate commitment to sustainability through various Strong t-FORUM events”. This collaboration will be significantly strengthened in September 2018 by the assignment of two one-year postgraduate scholarships. The award recipients will work in Naples (Italy) at CNR-IRISS, which also hosts the t-FORUM headquarters. Their research will focus on the impact of climate change on tourism development and innovation. Furthermore, they will assist the t-FORUM in setting up the infrastructure for gathering and transferring tourism intelligence worldwide, advancing the goals of these three institutions by bridging theory and practice.